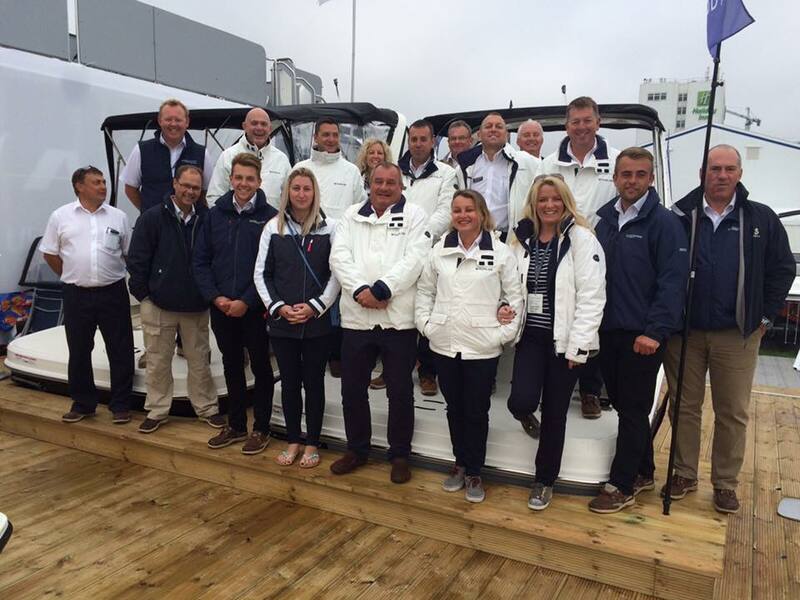 The Bates Team (less a few back at base) at Southampton Boat Show. Richard is fifth generation of the Bates family who have been present on the River Thames for over 150 years. Managing Director of both Bates Wharf Marine Sales Ltd & W.Bates & Son. Richard and David de Vere started Bates Wharf Marine Sales in 1991 after having been together with their previous employers since 1985. David entered the marine industry in 1972 working for Westerly Marine a yacht manufacturer on the South Coast. His past experience includes being one of the first ever importers of American power boats into the uk back in the 80s and managing the yacht racing division of a South Coast manufacturer. Today David is primarily responsible for all the financial aspects of all offices. Debbie (Bates) returned to work with Bates Wharf to assist with the financial aspect of both Bates Wharf and Bates Wharf Southern. She is also our in house IT whizz. With over 20 years experience in the boat industry, Claire originally joined BW as office manager but took a shine to new and used boat sales making her now our sales manager. Sarah is responsible for our printed marketing and administration as well as specialising in Sessa Marine new and used boat sales. Tony has a long history in power boat sales and joined our company in 2002 after having worked for Bayliner in Windermere for over 15 years where he gained extensive experience in American power boats. He oversees the after sales service and gives extensive tuition to new and used boat owners. Boat parts are her thing! Check out www.bateswharfparts.co.uk and get in touch for your boat part needs. Freddie has been in the boating industry for twenty years, starting his career in Brighton Marina. Freddie joined the Bates Wharf partnership in 1999 offering the company a coastal option and progressing into the sail boat market now as a leading Beneteau dealer. With over 15 years with Bates Wharf Southern, Richard has achieved his boyhood dream of working in the marine industry. Since then Richard has been working in sales and able to give full support to the hobby he loves. Alan joined Bates Wharf in 2008 to head up Eastbourne’s very busy brokerage office and has taken it from strength to strength. He has an extensive knowledge of the marine industry and is always on hand to give good advice for all boating needs. Gavin has a wealth of knowledge from his many years in the marine industry. He worked with Bayliner for over 20 years running the Poole office. As Manager of our Poole showroom Gavin has extensive experience of all aspects of running a successful boat sales company. Gemma has been with Bates Wharf since 2005 and has blossomed into a vital part of the company specialising in Bayliner power boat sales. She also manages the administration and day to day running of our Poole & Southampton offices. From boat valeting to antifoul to teak cleaning to demonstrations; no two days are the same for Harrison at Bates Wharf. With over 25 years experience in the industry, Steven’s primary responsibilities include the day to day running of the office and sales department. Nicola is your contact for anything to do with the marina at Chertsey whether you require mooring, crane lifts, pressure washing, electric and more! John looks after our marina and drives the crane for lifting boats in and out. Christopher joined the marina team and assists John day to day with lifts, replacing pontoons, maintaining boats and keeping our yard tidy.